South African deputy president DD Mabuza is a respected man in the ANC and among his fellow comrades. 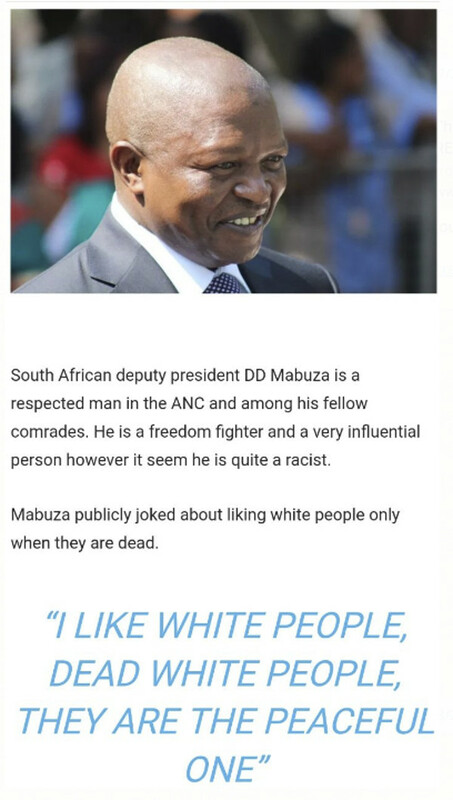 He is a freedom fighter and a very influential person however it seem he is quite a racist. This is according to report gathered from social media that has caused outrage online, several whites have promised to go file a case against him for hate speech. Im black and i am digusted by this.Jews use Africans as pawns to destroy whites its time to wake up!!! I’m glad to see a black man waking up to the Jew problem. Jews also played the key role in enslaving you and sending your people to America. Let me give you a tip. If you search for “White Monopoly Capitalists” in South Africa; you’ll discover that most, if not all of the “White Monopoly Capital” in South Africa is really “Jewish Monopoly Capital”. The Jews are the No 1 monopolists in South Africa and the vast majority of blacks don’t recognise this. Jews are scum. Beware of them. I can’t wait till a real nationalist government comes to the aid of Boers, and drives all the blacks out into some desert where they can rot ,and all the Jews can join them.